Jerk seasoning spices up these chicken breasts, which are sliced and served with charred sweetcorn & lime salsa. Heritage tomatoes add a splash of colour and sweetness, and little gem delivers a refreshing crunch. 1. Place the chicken breasts in a bowl with 2/3 of the jerk seasoning, a pinch of sea salt and 1/2 tbsp oil and mix well. 2. Heat a griddle pan (or frying pan) on a medium-high heat and cook the chicken breasts for 8-10 mins each side or until cooked through and the juices run clear. In the last 5 mins of the chicken cooking, drain the sweetcorn and add to the pan and cook until turning golden and chargrilled. 3. Meanwhile, thinly slice the spring onions, removing the root ends. Slice the cherry tomatoes in half and finely slice the radishes. Peel and de-stone the avocado and thinly slice. 4. To make the sweetcorn salsa; place the chargrilled sweetcorn in a bowl with the spring onions, the juice from the lime, remaining jerk seasoning and 1/2 tbsp oil. Season with sea salt and black pepper. 5. Roughly chop the gem lettuce, removing the root end and place in a bowl with the heritage tomatoes, avocado, radishes and half of the sweetcorn salsa. Toss gently and spoon out onto two plates. 6. 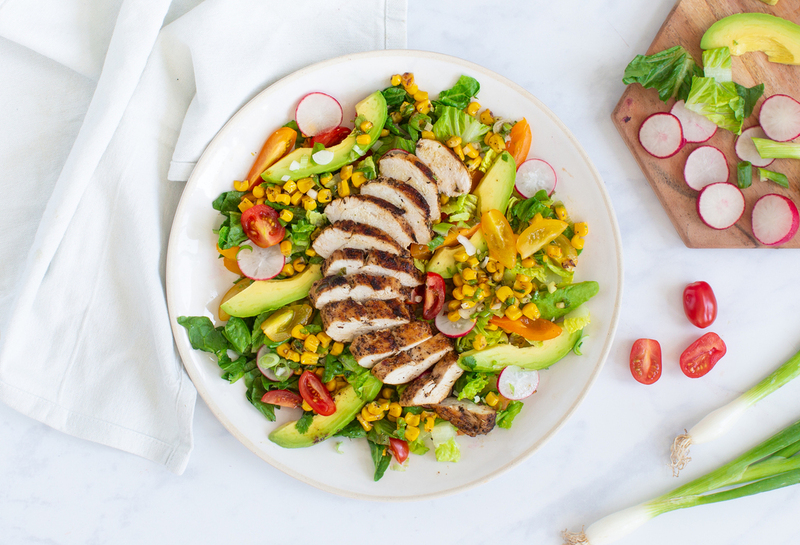 Thinly slice the chicken breasts and place over the salad and spoon over the remaining sweetcorn salsa.